What? A kitteh needs his fiber too, you know. What a fun thing to do! We hope you have a great Wednesday. Thank you! And thanks ever so much for stopping by! It's so nice to meet you! We haven't had any cat grass for ages - we are going to report Mum for neglect. Handsome Maxwell, you are so right, dude! Some greens are always nice to balance things out. :) Hugs to you, Faraday and Allie, too! FaRADaY: *waves paws wildly* HIIIIII!!!! oh yummmmmmmmmmmmmm. M - you have to get some of that for me!!!! That's not Spitty's grass, is it? He looks kind of mad today and this may be why. Yesterday he's blissfully nomming on his grass and today you have it. Maxwell: *looks reproachfully at Mama* Is this, like...HOT grass mom?!? DOOD, I gotta spot right here for you! 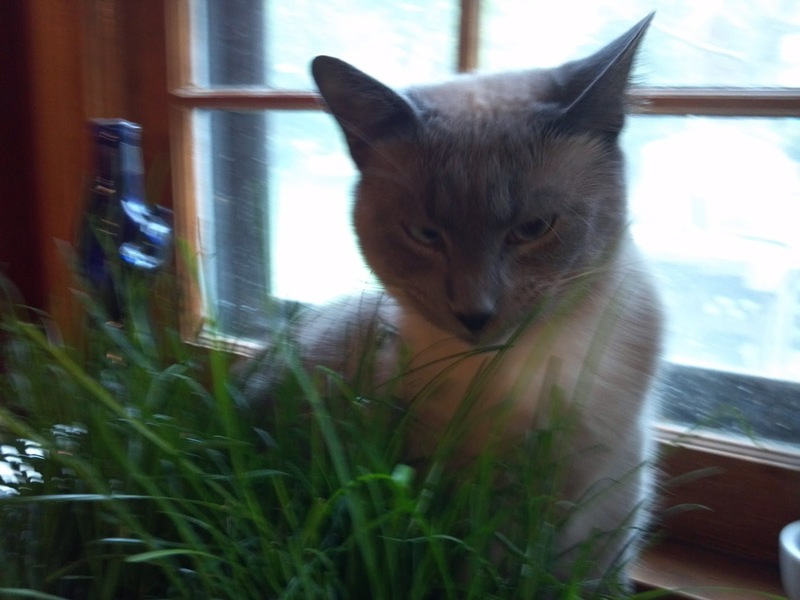 Still got the cat grass? Have a lovely wordless Wednesday. oooh yeah - the human keeps replanting it for us! SCORE! Hey! We just posted about cat grass too! Heh heh. Enjoy your fibre, Maxwell! Did you yak it up afterwards, like a good kitty? Maxwell: *signs to Casper* DUDE! How's it going? Glogirly can barely keep green things in the fridge. But I do stare longingly at that spikey green stuff outside the window. Ahhh yes! Nothing like a good vegetarian restaurant with a pretty view out the window.....then again, I also like the all you can eat buffer along the sidewalk in front of the porch! Maxwell: Yeah, I understand there's a great squirrel-and-chipmunk special going on right now! I can save you a blade of three...? Maxwell: Mama says that's better'n' Al dente... I have NO idea what that means though... just meowin'! We only have silk plants in our house. Harley LOVES grass, but I refuse to eat even a single blade! FaRADaY: just goes to prove my theory: gurlz are WEIRD. Maxwell: Mama said something to Papa about harvesting some of this for a breakfast power shake...and then Papa turned green. Bon appétit, mon ami ! Maxwell: Merci! C'est tres nommy! 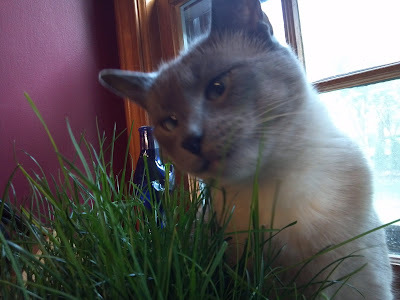 I love cat grass very much!! HI Michio & Adan! Nice to meet you! Thanks for stopping by! Cody, dood! Have a blade or three! Great Blog. Had to fix blogosphere to comment. Awesome heading.